So here's something you don't see everyday. Apparently, you can purchase prepaid credits for Smart, Sun and Talk 'N Text right from your very own GLOBE GCASH account! 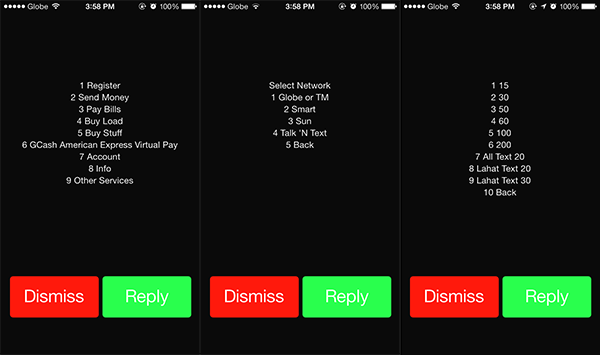 You can access the feature by dialing *143# on your GLOBE enabled mobile, chose the GCASH option, buy load and voila! Amidst the obvious competition, this actually felt kinda weird but I heard that the feature was pushed so it'll be easier for mobile users to connect regardless of what network you use. I imagine this should be pretty useful especially at the aftermath of Typhoon Yolanda when prepaid credits are being sold at overpriced rates in the affected provinces. With no additional charges, this would be like buying load from any regular store in the Metro. I am not sure of Smart has the same feature enabled but it would be nice if they did. To learn more about what else you can do with your GLOBE GCASH account, read our previous posts here.